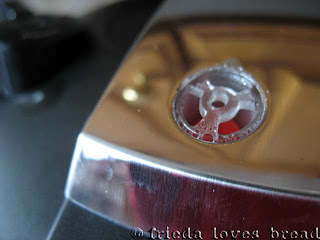 There is a universal fear when it comes to using pressure cookers. With a little bit of education and experience, I believe anyone can overcome that fear! What you see above are my two pressure cookers. The T-Fal on the left, is a 4.5 liter (4.75 quart) stove top pressure cooker. 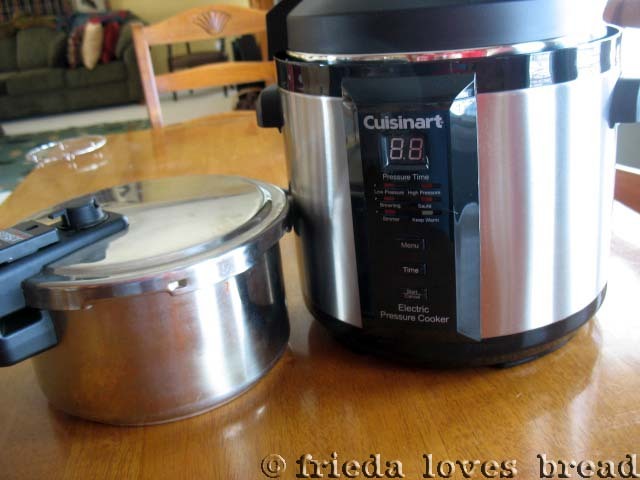 The Cuisinart on the right, is a 6 quart electric pressure cooker. Safety features are included on both cookers which are nice. There are some pros and cons of each, which I'll point out as I go along. First, this electric cooker is huge. Much larger than my traditional stove top cooker. It will take some considerable storage space....somewhere. As the note says on the top of the box, make sure you read all the instructions before starting. Fortunately, the instructions include pictures for the visually inclined (like me). This is a good time to pull out your cooker, touch it, feel it, otherwise, get to know it! This is a moisture collector, which simply clips on to the side of the cooker. 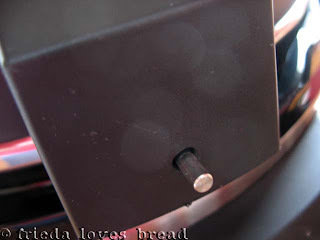 The cooker comes with a removable nonstick insert. These are the easy to read liquid levels. It is extremely important to stay under the 6 quart line. This is the weight that is snapped into place on the top. Make sure that the pressure "circles" line up. Rotate the lid to the left...that is counter clockwise for the analog clock users...you will hear a click. See this pin? When it is sticking OUT, it is UNlocked. When it in IN, it is locked. That's a safety feature of this cooker. It has two pressure levels: Low and High. I believe the low pressure setting (below 10 psi) is for more delicate vegetables, such as spinach, whereas high pressure (15 psi or higher) is for meats and hardier vegetables. It also comes with a browning, saute, simmer and keep warm settings. 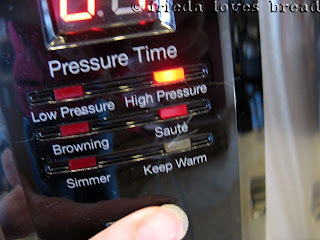 These settings are NOT available on my stove top pressure cooker. Pushing the MENU button will take you through each setting. I decided to try a simple recipe from the Cuisinart Recipe book. I filled up the cooker, locked the lid and set it on HIGH pressure (push the MENU button twice). Set the timer for 60 minutes. I just pushed the TIME button the number of minutes needed. 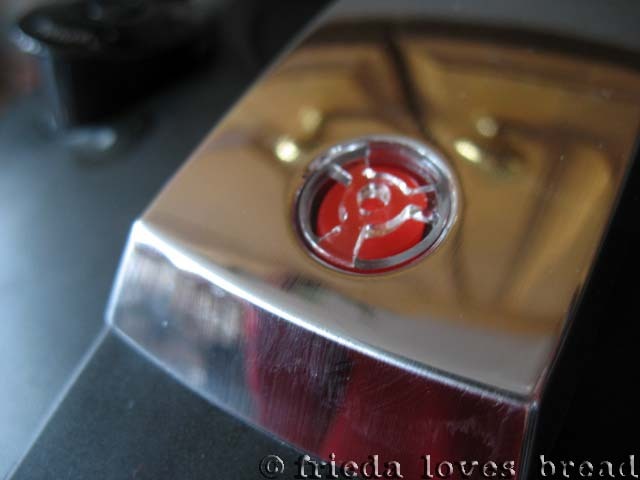 You will hear a little "hiss" of steam through the weight, and this little red button will rise up and the hissing will stop. 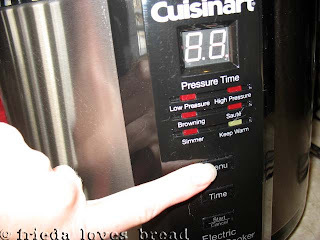 It can take anywhere from 5 minutes to 40 minutes for the cooker to come to pressure, depending on the recipe and if you use HIGH or LOW pressure settings. 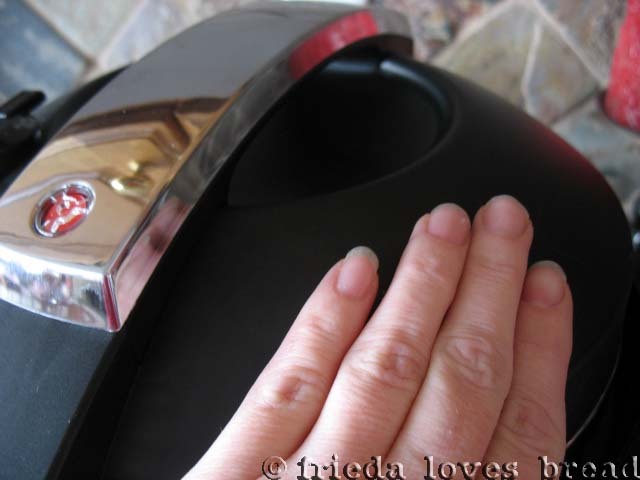 I touched the sides of the cooker. It was cool to the touch. Nice! I touched the top of the lid. It was also cool to the touch. I'm impressed! When the timer is done, you will hear an audible "beep" and the cooker will automatically go to the KEEP WARM setting. At this point, your recipe will give you two choices. One, you can allow the pressure to come down naturally on its own, or two, use the Quick Pressure Release method. Cuisinart recommends using the NATURAL release when cooking beef or boneless pork. 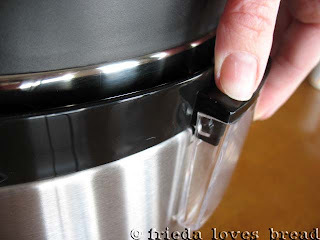 The QUICK release method is recommended for chicken, soups, vegetables and grains such as rice. Using the natural release method for these foods will result in a very soggy, overcooked product. 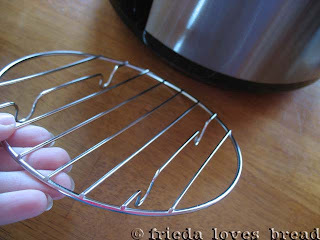 To do a QUICK release, use a pair of tongs to turn the weight to the right (clockwise). It will only take a small nudge. till the RED button dropped. That is my cue that it is safe to open the lid. So there you have it! 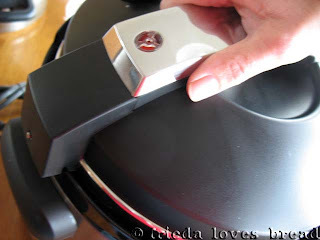 I love this cooker! Think of this as a crockpot on steroids! Size can be considered a pro or a con. 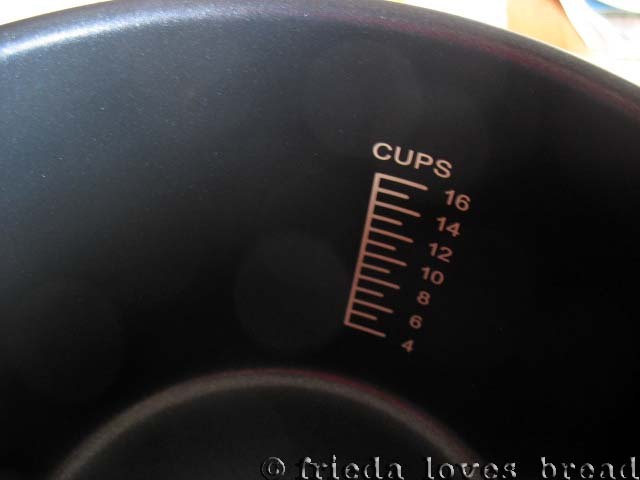 Pro for cooking larger amounts and a con for storage. Another con is that it cannot be used in a power outage. 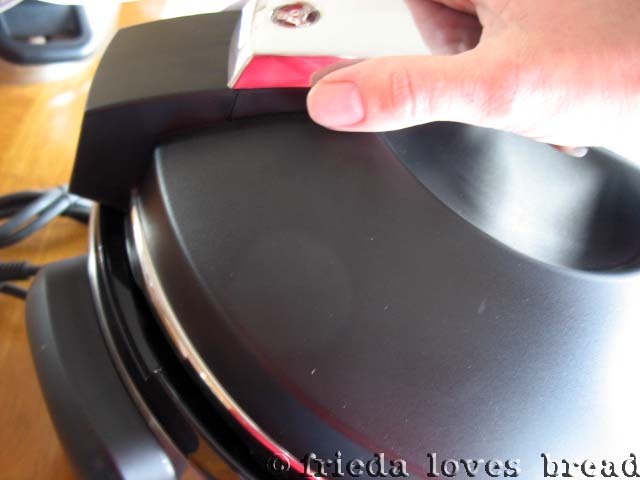 (I can use my stove top pressure cooker on my gas stove) Everything else is a pro: ease of use, stay cool exterior, non-stick interior, browning, sauteing, keep warm settings and ease of clean up. This cooker feels like a "set it and forget it" cooker, whereas my stove top cooker needs to be watched...timed...and removed from the burner. My next electric cooker post will feature a browned beef stock that took me 30 minutes to make and the ease of cleaning this cooker. Stay tuned! 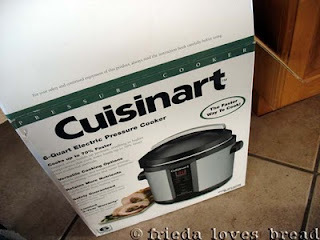 I LOVE my electric pressure cooker...I have the Cuisinart and I just bought a NESCO....I use them 3-4 times a week.....love that they turn themselves off and keep the food warm! My NESCO is also a steamer/slow cooker as well. I am one of those people who owns a pressure cooker and I have never used it. I am scared. Mine is a canner/cooker and I haven't dared even try it. I guess I need to get brave. 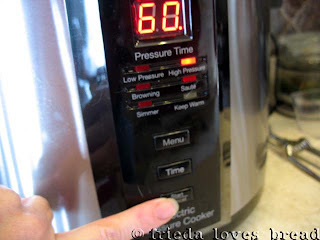 I call my pressure cooker my microwave crock pot. I just taught a class on pressure cooking, using my digital pressure cooker. My students LOVED it! Great tutorial, Frieda. If people would realize how easy these are to use, it opens up a whole new world. My Austrian Goulash took 25 minutes, instead of 2 hours, to be ready. Deby, that is SO awesome!! I would love to understand how to convert our favorite recipes (or if any conversion is necessary). I can't believe what a time saver this pressure cooker is! What a great tutorial! I've been trying for a while to get my hands on an electric pressure cooker so it was great to read about yours - in DETAIL! 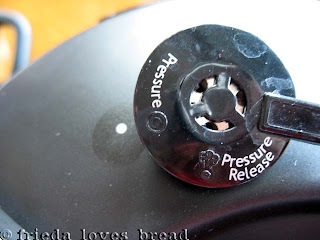 You do need to keep some things in mind when converting regular recipes to the pressure cooker. 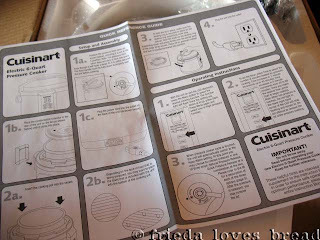 First, to save you the work, see if there are similar ones already written for the pressure cooker. Obviously, you already know how to pressure cook, but I have a Beginner Basics Series going on now and about the first four "recipe lessons" note special considerations for electrics. Happy pressure cooking, and I can't wait to read your next installment! I've been wanting a pressure cooker for a while now. So nice to read this post. Where did you buy yours? Thanks for the info, Laura! Barbara, I had a Williams Sonoma gift card and used it to buy the pressure cooker. The best price I've seen for these is at Costco, I think at around $69, though I just checked online and it is $85. Amazon has it for $79. I think you will truly love this. I hope you get one! Thanks Frieda. If I see it at Costco I'm going to snap it up. I am so happy to see the Pressure Cooker undergo a modern revival! I've used one for years and years. I now have two, neither of which are electric. 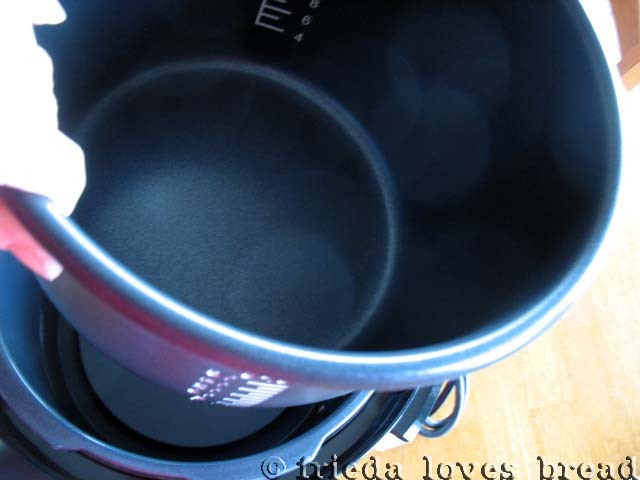 I prefer being able to control my pressure and I also like that I can quick release my pot using cool water - especially handy when cooking risotto and it needs to stop cooking immediately. 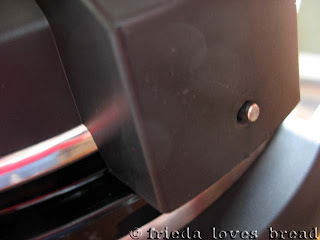 I have, however, graduated from the old rocker style pressure cooker to the more modern stainless steel ones. I have a Magefesa (made in Italy) and it's my all-time favorite. I recently bought a new Fagor, which is also quite nice. Do the electric ones have a quick release option? Bellestx, yes, the electric one has a quick release option! It has a recipe for cooking risotto, which I plan to try soon. I'm thankful i found your website. Unfortunately I found it AFTER I had a problem with the countdown and discovered my error. I can relate! I'm a very visual person and rely on photos or videos. 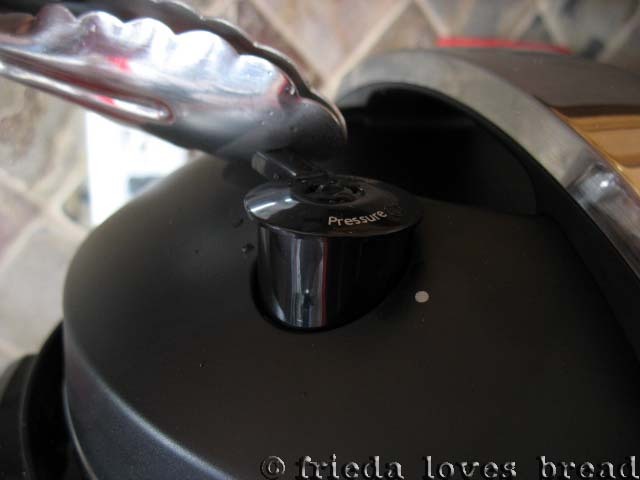 You will enjoy using your pressure cooker! Thanks for this post, I just got my pressure cooker, same model as yours and now I'm really excited to try some recipes! Jane, Congratulations!! You will really enjoy your new pressure cooker!